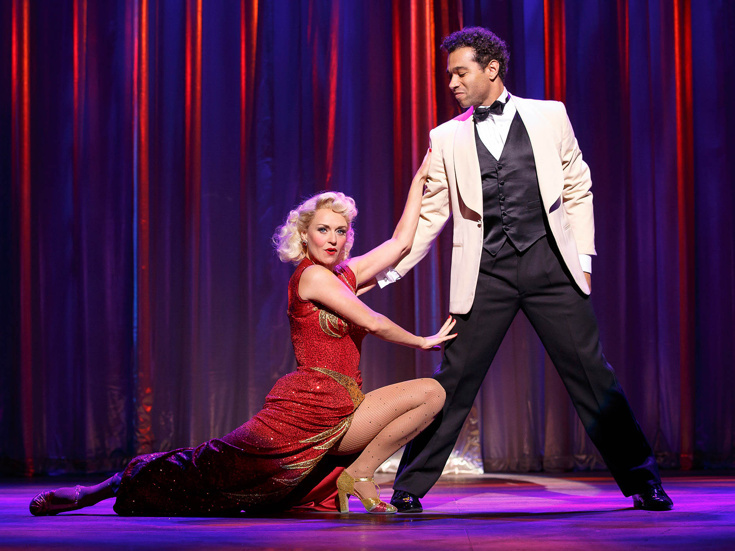 Megan Sikora & Corbin Bleu in "Holiday Inn"
Jump, kick, split and cheer for the winners of the Chita Rivera Awards, honoring the best in dance! The top picks were announced on September 11 at the Al Hirschfeld Theatre. In addition to winners in the competitive categories, the star-packed night offered hat-tips to dance legend Tommy Tune who was presented with the Lifetime Achievement Award, Waitress director Diane Paulus who was honored with the Outstanding Contribution to Musical Theater Award and Antonio Vendome who received the Outstanding Contribution to the Arts and Humanities Award. Bebe Neuwirth hosted the ceremony, which was directed by Randy Skinner. Winners can be found below in bold and preceded by an asterisk. The Chita Rivera Awards choreography in film honors went to London Road (dance by Javier DeFrutos) and Restless Creature (directed by Linda Saffire and Adam Schlesinger).